Though entrepreneurs offering new quadcopters and ultra-lights seem to pop up daily, government filings show that some long-established defense contractors are successfully transitioning their well-seasoned military aircraft into the crowded commercial market. According to filings with the Federal Aviation Administration (FAA) at least 10 companies have requested or received exemptions to operate remotely piloted aircraft, commonly called drones, made by major defense companies including Lockheed Martin and AeroVironment. As of press time half of those requests have gotten a go-ahead and the pace may now be poised to quicken. The FAA has changed its process in recent months and once an aircraft has been vetted and approved for one application it is set to get a fairly swift go-ahead going forward. For defense firms the attraction to the commercial market is easy to understand. Military budgets overall are under pressure and commercial operators generally have fewer wickets to run through to reach a decision. 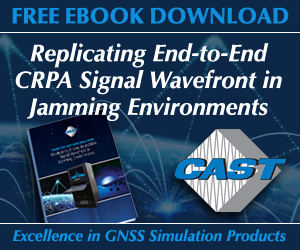 But there is more to it than simply hedging one’s business case, suggested Michael Blades, senior analyst for the aerospace and defense industry at the market research firm Frost & Sullivan. 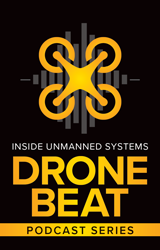 Blade surveyed the global market for unmanned aircraft breaking it down into military, commercial and hobby markets. The sales for military Unmanned Aircraft Systems (UAS) would reach an estimated $11.6 billion by 2020 according to his estimate. He gauged the commercial market—which he distinguished as including missions that operate at 500 feet or above and involve “long-term, high endurance” niche tasks—as reaching $5.4 billion by 2019 and $6.5 billion by 2020, he told the audience at the Drone Tech conference in Atlanta. 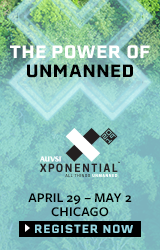 Drone Tech was co-located with AUVSI’s Unmanned Systems 2015. The hobby market, which Blades described as typified by the popular DJI rotorcraft, would grow to roughly $4.5 billion by 2020, he said. But that hobby market is actually swirling with for-profit companies using small UAS, he pointed out. Some 60 percent of the more than 1,000 Section 333 exemptions for commercial operations given out so far by the FAA, he said, have gone to companies that use DJI aircraft as their platforms. “So you can’t say the hobby market is not part of the commercial market,” Blades told the audience. 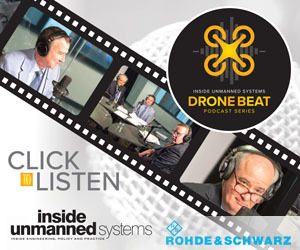 If you take the small aircraft into account, he said, the nondefense market will eclipse the military market in the next five years—and that is just for UAS platforms and sensors, not services. “Take that hobby market piece and put it on top of the commercial market piece—by 2020 it surpasses the military market.” Blades told attendees. 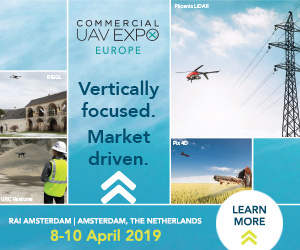 A search for established defense UAS platforms within the roughly 3,000 Section 333 applications submitted to the FAA show that Lockheed Martin’s Indago quadcopter and the AeroVironment Puma, a hand-launched, fixed-wing UAS, are the most popular so far among commercial operators. These platforms, however, are seldom intended to be the companies’ only flight option. Most of the nearly dozen firms identified as choosing a military-pedigreed UAS are selecting it as one of a wide inventory of unmanned aircraft, sometimes a dozen different platforms, giving them the ability to tailor their flights to each job at hand. 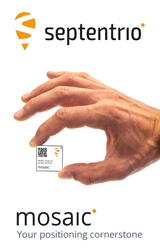 The Indago platform was developed by Lockheed Martin and Utah-based Procerus, a firm Lockheed bought in 2012. 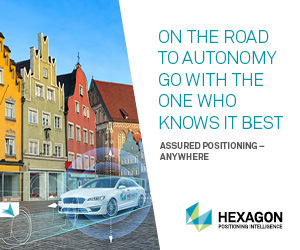 Procerus makes the popular Kestrel autopilot, which has a number of features including visual tracking. 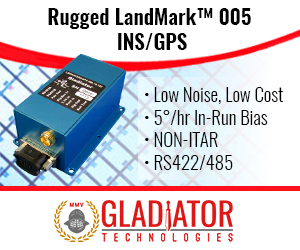 Though the Indago has GPS and inertial sensors—the no-GPS-needed visual-tracking technology enables the UAS to follow a target visually, or fix on a point and use it for guidance. Weighing less than five pounds including payload the Indago can stay aloft for as much as 55 minutes, said Jay McConville, director of business development at Lockheed Martin’s unmanned integrated systems. The vehicle has won over at least four for-profit firms in the U.S. including Houston-based Trumbull Unmanned. Trumbull plans to focus on the energy industry, offering a wide variety of inspection and monitoring services including wildlife surveillance as well as support to first responders. The firm was approved to operate a dozen different UAS as part of its service and has since filed an amendment asking to add more to the list. Huntsville, Ala.-based enrGies was granted an exemption by aviation regulators in late July to use the Indago to gather aerial data. The firm has been providing operations and engineering support to government agencies for UAS missions and now wants to expand its services to a wider range of applications including precision farming, infrastructure monitoring, disaster damage assessment, wildlife and wildfire monitoring, construction, mining and UAS research. Like other companies, enrGies’ plans include flying more than a dozen aircraft. Among those, interestingly, is the Desert Hawk III—another Lockheed Martin product that, in this case, has been used by the British military. The hand-launched Desert Hawk III can handle color, low-light and infrared sensors. Saunter Raven of Madison, S.D., plans to use the Indago to provide imagery to customers across the upper Midwest. The firm wants to offer services for precision agriculture, energy grid and tower inspection, and filming, photos and surveying as well as emergency response. Frontera of Golden Canyon, Ariz., expressed interest in the K-MAX, another Lockheed Martin platform, and Northrop Grumman’s Fire Scout. Though the current exemptions do not extend to UAS that weigh more than 55 lbs., the FAA has made it clear that it would be more flexible with the Section 333 process. 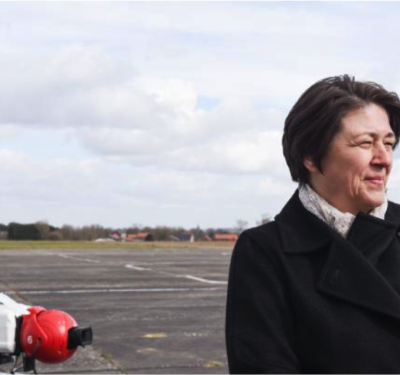 The K-MAX is a heavy lift, rotary-wing aircraft said McConville that has gone from being manned-only to manned-maybe. “Of course it’s a commercial aircraft that is used in the manned mode for heavy cargo type of operations and nonmilitary use—and has been for a long time,” he said. We ‘unmanned’ K-MAX with our partner (Kaman Aerospace Corporation) for use by the United States Marine Corps in Afghanistan.” There, he said, the K-MAX moved four and a half million pounds of cargo, taking the equivalent of 900 cargo vehicles off the road. The K-MAX already has been used for logging and Lockheed is proposing a new role—firefighting (See Indago, K-MAX Effective Against Wildfires). 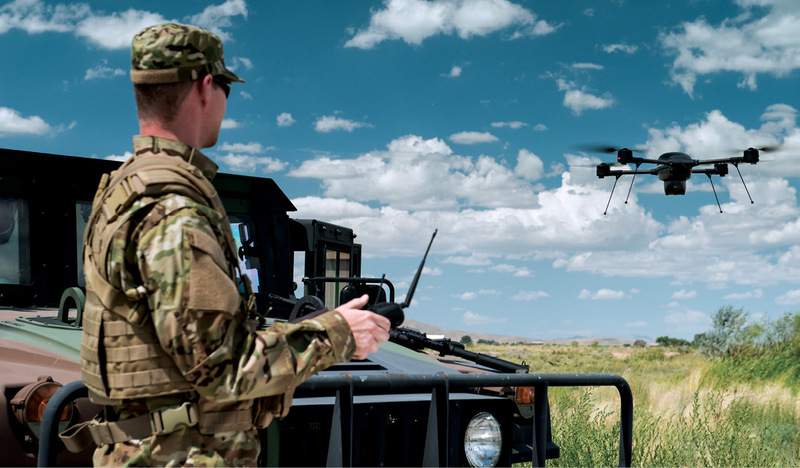 Duke Energy Business Services, a multinational utility company that serves some 23 million people in the United States plans to use at least four defense cross-over UAS to help it monitor and maintain its infrastructure. The Charlotte, N.C., firm, which serves customers across six states, was approved to fly UAS to aid in the construction, operation and repair of its utility infrastructure as well support its maintenance. Duke anticipates doing inspections of its spoilers, stacks and solar arrays as well as monitoring vegetation and power lines. To do all of this the company plans to operate 16 different unmanned aircraft including the Indago and AeroVironment’s Puma, Shrike and Qube. The Shrike is a small vertical takeoff/vertical landing aircraft that can be carried and deployed by a single person. The quadcopter operates quietly and can hover-and-stare or perch-and-stare. It was designed for “front-line day/night intelligence, surveillance and reconnaissance,” according to the company and has a modular payload bay. The Qube quadcopter is similar to the Shrike in appearance though it uses a simpler user interface. The 3-foot quadcopter is able to stay aloft for as long as 40 minutes and carries dual high-resolution color and thermal cameras. Designed for police use, the quadrotor can fit into the trunk of a car and be assembled for launch in less than 5 minutes. Once aloft the Qube transmits live video directly to the operator. Duke Energy is not the only firm with FAA approval to use the Qube. 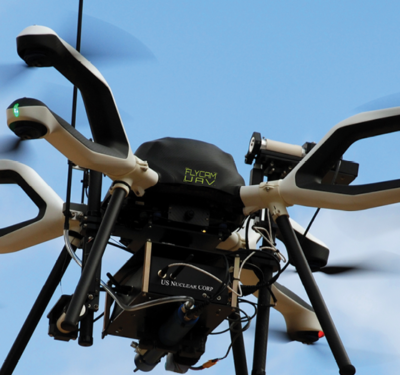 Blue-Chip Unmanned Aerial Solutions, Inc. got the thumbs-up July 20 to fly that platform as well as a dozen other types and sizes of unmanned aircraft. The Wichita, Kan., firm plans to provide services to the oil and gas industry and the agricultural sector. It will also offer aerial and wildlife photography. Duke Energy and three other firms will be using another battle-tested AeroVironment aircraft—the Puma. 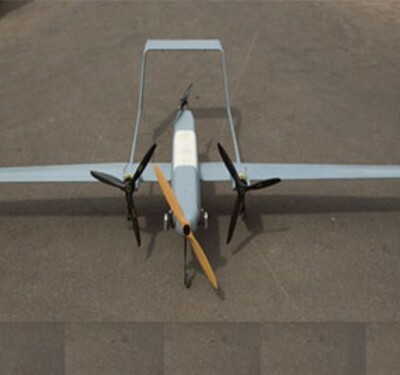 The Puma is a fixed-wing UAS that can fly for up to two hours over a range of 15 km (9.3 miles). It has 9-foot wings, weighs 13 lbs. and has one other particularly interesting feature: it’s waterproof. The Puma got a big break in 2013 when the FAA issued one of two restricted category type certificates allowing it to fly across arctic waters to support oil spill response and wildlife surveillance over the Beaufort Sea. Those approvals, the other one was issued to Insitu’s Scan Eagle, were the first time commercial UAS operations were allowed in the United States. Another break came the following year when regulators issued a Certificate of Waiver or Authorization (COA) allowing the company to survey pipelines, roads and equipment at the Prudhoe Bay, AK, oilfield for energy company BP (British Petroleum). At least three other firms now have plans to use the Puma commercially. WinTec Arrowmaker, Inc., located in Fort Washington, Md., intends to use the Puma and at least two other UAS to do infrastructure inspections, aerial photography, crop monitoring, photogrammetry, disaster survey and search and rescue as well as research and development. Cambervision of Needham, Mass., asked in June to add the Puma to its already approved exemption. The firm also sought to expand its offerings from aerial data collection and training to be able to provide UAS-based photography and videography. The energy sector is of particular interest given the firm’s work along Alaska’s North Slope. That is experience upon which the firm wants to build, Brasel said, not just in the United States but globally. 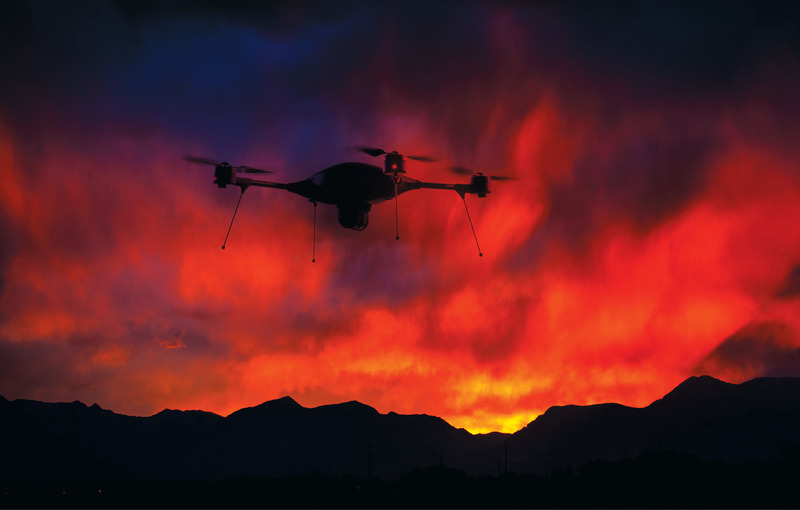 Energy firms are moving quickly to adopt UAS technology in part, he suggested, because the applicability of the technology is fairly clear and direct. 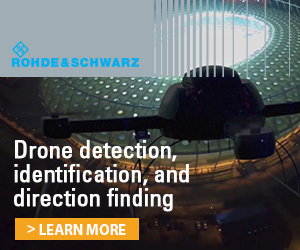 “Things like surveillance of pipelines and surveillance of power line transmission, access roads—that’s the kind of stuff UAVs (unmanned aerial vehicles) have been doing for a long time in the military sector. The translation of the technology over to the energy sector is pretty straightforward,” he explained. 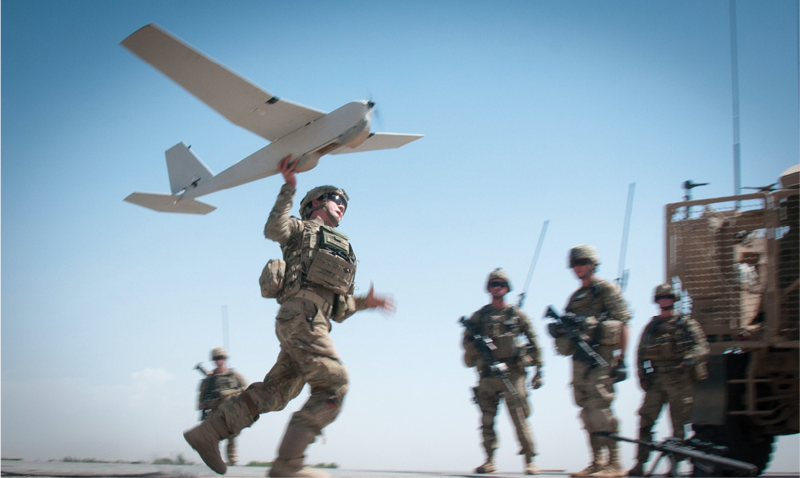 AeroVironment, however, is interested in building on its experience to develop a new business line. While it is prepared to sell the Puma as a platform, the firm wants to use its hardware and expertise to provide information services. “We’ve learned a lot—you make a lot of mistakes you learn a lot,“ he told the Drone Tech attendees. While the speed and markedly lower expense of using unmanned aircraft is a key selling point—his firm can do an Alaska pipeline survey job that used to take a week in just 30 minutes— the real value is delivering to the customer insights that they can use to make better decisions. “That kind of information—that really helps somebody understand their operation better and manage it more effectively,” Gitlin said.